Is Amazon's boss the new Steve Jobs? In a world of dull tech CEOs – ten points for anyone who can say three interesting things about Samsung's CEO; hell, ten points for anyone who knows his name without Googling it*– Jeff Bezos stands out. His Amazon empire has crushed retail rivals, provided a platform for the internet's biggest names and become a key player in the tablet business, and he's just getting started. Is Jeff Bezos the new Steve Jobs? The question isn't as crazy as it sounds. While Bezos is a businessman first and a technologist second, he shares the late Jobs' ability to see into the future - and like Jobs, he thinks big and plays for keeps. Although Bezos studied science and computer science, he didn't start off in the tech industry: in 1994 he was pulling in a six-figure salary from Wall Street investment firm DE Shaw & Co, where he was the youngest senior vice-president the firm had ever had. Bezos was quick to recognise the potential of e-commerce and jumped ship to start a new business, Amazon.com, which would sell books online. He didn't choose books because he loved books, or for sentimental reasons; of the 20-odd potential products he considered selling, he decided that books were the best bet because traditional bookshops could only ever stock a tiny proportion of the available titles. Internet bookshops had, and have, no such limits. In Amazon's early days, Bezos demonstrated a Jobsian level of salesmanship, innovation and marketing. He sweet-talked family and friends into fronting $1 million for his new venture, was quick to realise the power of user reviews and automatic product recommendations, and sent trucks past Barnes & Noble bookshops advertising Amazon's URL. Trucks aside, Amazon didn't advertise at first: users loved the site, its speed and its prices (helped in part by Amazon's willingness to lose money - it didn't make a profit until late 2001) and told their family and friends about it. 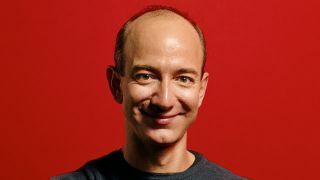 Like Jobs, Bezos isn't the easiest boss to work for – there are tales of Bezos berating employees over relatively small issues - but where Jobs hated imperfection Bezos seems quite happy with it. As the WSJ reports, "Bezos's philosophy was to get to market quickly, in order to get a jump on the competition, and to fix problems and improve the site as people started using it." He took the same approach to the Kindle, and you can see it in the Kindle Fire too: Bezos's method is to launch fast, launch big, and file down the rough edges later. Steve Jobs liked to quote the hockey player Wayne Gretzky, who said "I skate to where the puck is going to be, not where it has been." Bezos, we're sure, likes the sentiment too, because that's exactly what he does: he predicts what's going to disrupt his business and does the disruption himself. The iPhone exists because Steve Jobs knew that phones would largely replace stand-alone MP3 players, and many of Amazon's products exist for similar reasons: if anyone's going to disrupt an Amazon business, Bezos wants it to be Amazon. When Bezos realised that ebooks would ultimately outsell printed ones he built an ereading device and kept on refining it; when he realised that traditional publishers could be disrupted he provided an indie publishing platform and set up a book publishing division too. When it was clear that discs would die out, Amazon sold MP3s, offered a cloud-based music player and started streaming TV and movies through Amazon Prime. When cloud computing started to become a big deal, Amazon offered storage and servers. And when it became apparent that smartphones and tablets would replace many PCs and e-readers, Amazon made apps, an App Store, and the Kindle Fire tablets. If the rumour mill is correct, Amazon's even working on a phone. There's a strong argument that Amazon is taking Microsoft's place at the top table of tech: its $115 billion market capitalisation may be roughly half of Microsoft's, but if the future of the PC is the Personal Cloud rather than the Personal Computer, a battle not of hardware but of ecosystems and media services, then Amazon is already doing rather well. Five years ago the idea of Amazon kicking it with Apple, Google and Microsoft might have seemed rather far-fetched, but that's exactly where Amazon is today. Not bad for a bookshop. Amazon's phenomenal rise is an impressive achievement, but Bezos is just getting started: where other tech CEOs might tell you that the sky's the limit, Bezos has loftier plans. In 2000, he founded Blue Origin, an aerospace company that's "working to lower the cost of spaceflight so that many people can afford to go." Its motto, "gradatim ferociter", is Latin for "step by step, ferociously". It's a good motto for an aerospace company, but it's a pretty good fit for Jeff Bezos too.